Travel trade is a $2 trillion dollar industry and we want to make sure you’re IN. The PR team will lead delegations and provide co-op opportunities to participate in some of the biggest travel tradeshows in the world. Here is a list of shows we will be attending and details on how you can join us. Send an email to Industry.Relations@state.nm.us for more details. Background: NMTD confirmed this location due to the timeliness of IMM. By hosting a media mission on the two days prior to IMM, we will be able to meet with journalists who are in town for IMM/New York Times Travel Show and meet with different publications and freelancers that are based in the city. Send new developments and events for your region or destination to Industry.Relations@state.nm.us. Your submissions will be included in our pitches to journalists and any follow-up materials. Background: IMM is the industry’s leading event for the media to meet travel and tourism brands. In a single day, exhibitors will have 20+ deskside meetings with journalists and the opportunity to increase visitation. This is also a perfect opportunity for relationship building with travel writers from around the world. NMTD has purchased an exhibitor table. We welcome industry partners to submit travel PR pitches to us and/or take advantage of your own branded exhibitor table, expanding the New Mexico presence. Send new developments and events for your region or destination to Industry.Relations@state.nm.us. Your submissions will be included in our pitches to journalists and any follow-up materials. You may also opt to expand the New Mexico presence at IMM by purchasing your own branded exhibitor table. Send an email to Aimee.Awonohopay@state.nm.us for details on exhibitor tables. Background: The Travel and Adventure Show is an opportunity to meet face-to-face with tens of thousands of ready-to-buy travelers in one our key markets. 78% of attendees that attend a Travel and Adventure Show from a destination they met at the show. Tourism Santa Fe will attend as an exhibitor. NMTD will have a #NewMexicoTRUE banner onsite to help brand all partners in attendance. Industry partners are encouraged to purchase an exhibitor booth and expand the New Mexico presence. You may opt to expand the New Mexico presence at Travel and Adventure Show Denver by purchasing your own branded exhibitor table. Send an email to Aimee.Awonohopay@state.nm.us for details and facilitative assistance. Background: Texas is an important drive market for us all. 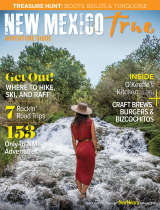 NMTD will host a multi-day media mission in one of our best markets, connecting travel writers with the best New Mexico destinations and experiences. Check back often, as we will be seeking industry partners to travel to Texas with us! Background: IPW is the largest generator of travel to the United States. It has generated $4.7 billion in future travel. Over 70 countries, travel buyers and media will be on site to conduct business at the country’s largest travel trade show. Over three days, we will connect with the world’s top travel buyers in one-on-one business appointments and networking events. Don’t miss Media Marketplace, connecting your destination with 25+ travel writers from around the globe. NMTD will purchase a shared booth with coop opportunities for partners. We will also lead efforts to brand all New Mexico delegates in expanding our “New Mexico aisle” at the show. We welcome industry partners to submit travel PR pitches to us and/or take advantage of coop booth space, expanding the New Mexico presence. Send new developments and events for your region or destination to Industry.Relations@state.nm.us. Your submissions will be included in our pitches to tour operators and journalists, including any follow-up materials. You may also opt to expand the New Mexico aisle at IPW by purchasing a coop booth space. Send an email to Aimee.Awonohopay@state.nm.us for details on booth space. Stay tuned for more details on how you can participate in IPW!